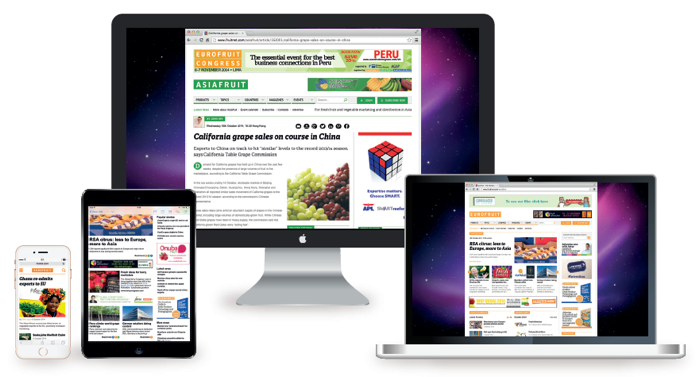 Fruitnet is the fresh produce industry’s global source of news, ..
Fruitnet brings together several of the fresh produce industry’s leading publications to provide a single, reliable source of news, insight and analysis. Fruitnet is the only news provider that can deliver informed and high-profile coverage of the entire global fresh produce business, reporting on developments in all major markets via an international network of reporters. The coverage is comprehensive, but not congested; Fruitnet’s editors select only the most relevant and important stories for publication. Advertising on Fruitnet puts your company in front of tens of thousands of key decision-makers in the global fresh produce business. For more details of banner options and prices, please download the Fruitnet media pack. Fruitnet Daily News is a free, premium-quality news service sent via email to tens of thousands of fresh produce industry professionals worldwide every day. The service includes carefully selected stories, interviews and features produced by the editors and journalists behind Eurofruit, Asiafruit and Americafruit, published by Market Intelligence. To receive Fruitnet Daily News, enter your email address in the box at the top of the right-hand column on this page, or contact Michelle Walsh via subscriptions@fruitnet.com or by calling +44 20 7501 0311. Fruitnet publications also organise fresh produce conference events all over the world – the best way to explore commercial opportunities and make new business contacts. The group’s annual events now include Asiafruit Congress, Eurofruit Business Forum, Eurofruit Congress Southern Hemisphere, Global Berry Congress, Asiafruit Market Insight, Fresh Produce India and European Vegetable Strategies. The Fruitnet Media International Group comprises Eurofruit, Asiafruit, Americafruit, Fresh Produce Journal, Produce Plus and Germany’s leading fresh produce trade publication Fruchthandel Magazine.